I wrote nearly a month ago that "The Worse Things Were For The Mining Sector, The Better They Will Get". 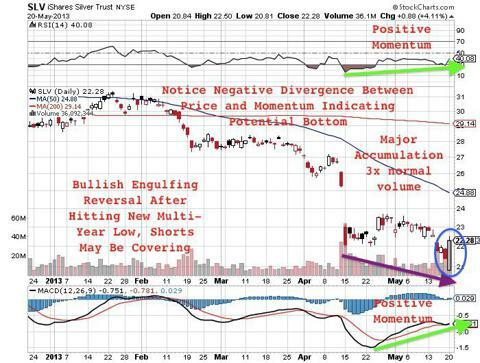 This was after the first downward plunge in gold (GLD) and silver (SLV) in April due to the Goldman short. 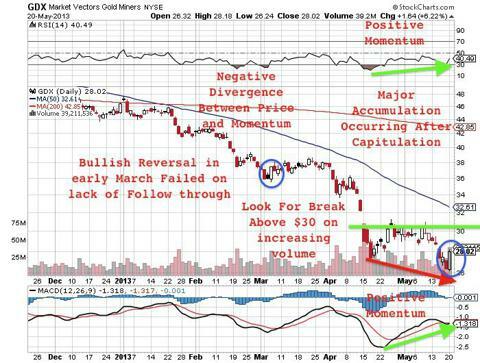 Now four weeks later, gold, silver and the miners (GDX) tested that April low and even fell below it only to reverse higher than the previous day's selling. 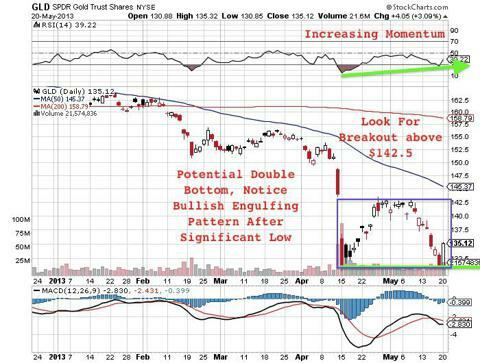 Across the precious metals board, we witnessed bullish engulfing patterns. We witnessed a similar reversal back in October of 2011 in the S&P500 (SPY) when we called for a bullish upturn in equities. See the video update from back then. We saw today (Monday) gold, silver and both the large and junior miners (GDXJ) dip lower at the open and close above Friday's high on more than triple average volume. This is a significant technical development as it means the gold bulls have regained control at a key technical low. Silver hit a five year trailing average in the low 20′s and gold hit a three year trailing average below $1350. Multi-year support should hold after this downturn for close to two years. This is one of the first major bullish engulfing's since the decline and may suggest that a low is in place and the end of the decline may be near. It at least cautions a short term reprieve of the recent downturn. This technical occurrence happened at the same time as Moody's threatens a credit downgrade for the United States. According to them not enough is being done in the U.S. to bring down soaring deficits. Don't forget the downgrade from the S&P in August of 2011 sent gold soaring to $1900. Do not be surprised to see a reemergence of sovereign debt issues in the United States. The U.S. dollar (UUP) and long-term Treasury bonds (TLT) have been direct beneficiaries of the recent Japanese yen (FXY) devaluation and may soon see topping action. This could spark a rally into the commodities (DBC), energy (XLE), precious metals and the miners which historically has a negative correlation with bonds and dollar strength.